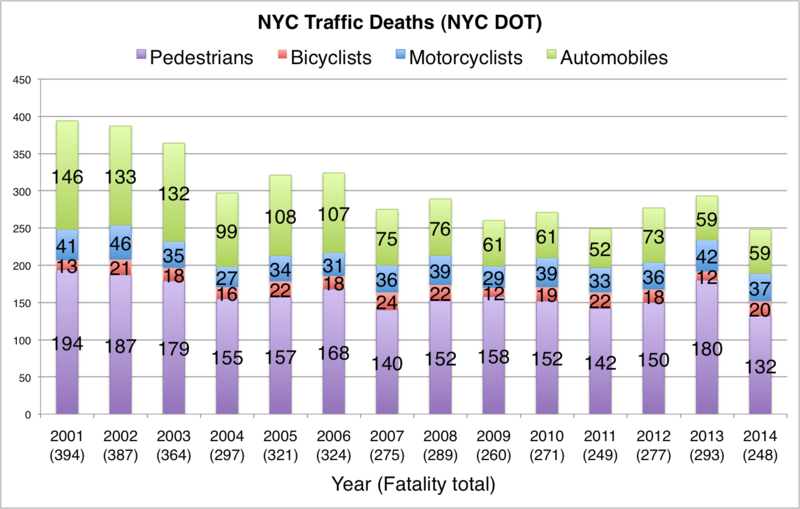 Last week, City Hall came out with the preliminary total for NYC traffic deaths in 2014. Pedestrian fatalities reached an all-time low and overall traffic deaths may have too, indicating that the de Blasio administration’s street safety policies made an impact in the first year of its Vision Zero initiative. With at least 248 lives lost, however, NYC streets remain far more dangerous than those of global peers like London or Berlin. A closer look at the data reveals that while traffic deaths in 2014 dropped significantly compared to 2013, last year was more or less within the same range that has prevailed since 2007. To sustain significant, lasting citywide improvements in street safety, Mayor de Blasio will have to build on the policy successes of 2014 and redouble City Hall’s commitment to Vision Zero. Traffic deaths in NYC have been steadily declining for about two decades. Since the turn of the century, a drop in fatalities among car and truck occupants, down from 146 in 2001 to a low of 52 in 2011 (though rising to 59 last year), accounts for most of the improvement. 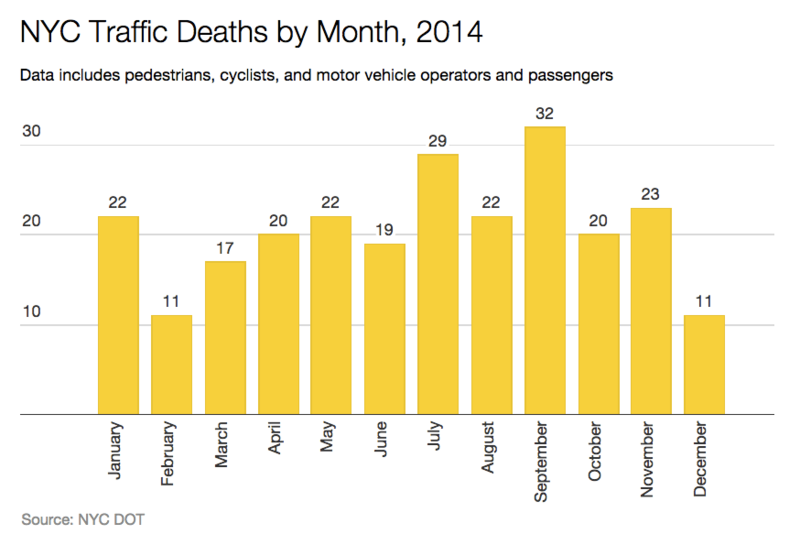 The most encouraging signal in 2014 was that pedestrian safety markedly improved. Last year’s 132 fatalities were an all-time low, down from 194 in 2001, following a spike to 180 pedestrian deaths in 2013. Cyclist fatalities have swung within the range of 12 to 24 each year since 2001. While the increase in cycling during this time means that biking in New York has become safer, the jump from 12 bicyclist deaths in 2013 to 20 in 2014 is especially troubling. Only one of the 20 cyclist fatalities in 2014 occurred inside the Citi Bike zone, lending more strength to the notion that expanding bike-share and protected bike lanes, which are more common in the Citi Bike service area, can have a major effect on safety. A breakdown of traffic deaths by month shows July and September to be the deadliest, while February and December had the fewest fatalities last year. It’s important to note that the data released last week are subject to small revisions. For example, the Daily News reported last Tuesday that the city had 131 pedestrian deaths and 250 total traffic fatalities last year, while on Thursday the Times said there were 132 pedestrian deaths and 248 total fatalities. The new data from 2014 help us judge how the city is doing on its street safety goals. In the first year of the de Blasio administration, the long-term trend of declining traffic deaths continued. Vision Zero calls for faster change. To put NYC on track to eliminate traffic deaths by 2024, City Hall has to intensify its focus on street design and law enforcement to prevent deadly driving. The number one thing Mayor de Blasio and DOT can do to speed up Vision Zero is to get the guts to override community boards when they stand in the way of proven street safety improvements. The process is broken, and leaves too much power in the hands of non-experts. Yup, there needs to be major street redesigns/reallocations of space all over the city. Is there anything big as the 1st and 2nd Ave parking protected lanes in planning? What are the biggest complete streets projects planned for 2015? And that large thing blocking the bike path is, what…an act of God? MTA/NYCDOT is working on adding SBS to the Jamaica-Flushing corridor. Probably just main st, maybe some improvements on 164 or kissena/parsons. Their docs mention pedestrian safety, Rozic is pushing for safety improvements there too. No mention of cycling. DOT is looking at widening some sidewalks in downtown flushing too. The objective fact is that bicyclists are (along with pedestrians) the aggrieved party; and that drivers are the perpetrators of violence. Unfortunately, this fact all too often gets ignored. This due partly to the windshield-perspective propaganda which creates the false equation “driver=citizen”, hegemonically normalising the filthy act of driving and thereby poisoning the public discourse. But it is due in part also to the constant law-breaking on the part of too many of us which (notwithstanding the empty self-absolution “but I’m safe”) ruptures the natural alliance of cyclists and pedestrians against motorised terror, and which bolsters the widespread public perception of us as unsympathetic. Stopping bicyclists from breaking the law is not the only way — or even a chief way — of preventing cyclists’ deaths; nor would the safety of cyclists be the main result of cyclists riding lawfully. But our own behaviour is definitely part of the mix in determining how the future plays out in terms of street design. No one wants to be Lance anymore. But a lot of people would probably experiment with whatever f1champ is smoking. Good to hear about the new SBS, but only one announced? There should be a solid master plan already and several implementations going on at a time (at least announced and in early stages). As for complete streets and bicycling infrastructure, unreal. Every avenue in Manhattan should be parking protect, and most arteries in the boroughs. I could probably paint a new buffered bicycle lane through an entire neighborhood by myself in a week. So slow these processes. I mentioned that one because its near to where I live and I saw something about it on today’s headlines. All SBS lines have been built incrementally. Which ones are completed at this point? There are capital improvements (stations, bus bulbs, curb extensions etc…) planned for this year and next on the M34, S79, B46, Bx41, not sure what others. For new projects, in addition to Flushing-Jamaica they are also looking at Woodhaven/Cross Bay. M86 is supposed to start this year. Here’s an old report on SBS from 2009 I think, starting on page 22 (30 in the pdf) it shows potential SBS routes for each borough. They’ve started work on some of them already. An updated report from 2013. Page 15 (17 in the pdf) has an updated list of potential corridors. Maybe there isn’t the sort of master plan where they have the next five years of construction planned out, and the roll-out has been slow, but there are existing SBS lines with ongoing work, a third crosstown line in Manhattan, Flushing-Jamaica and Woodhaven/crossbay in Queens that are in planning, and several more at a more conceptual state. Instead of (or in addition to) parking protected bike lanes in some (not all) areas I think “neighborhood greenways” would be more appropriate. If you’ve never been to Portland or Seattle they are great low stress bike routes when done well, but they aren’t always done well. Here are some projects from DOT. If De Blasio was serious about eliminating deaths from motor vehicle collisions in ten years he would be moving much more aggressively on these projects than he has been. At the same time he hasn’t thrown up road blocks and killed what momentum there was when he entered office. He hasn’t been perfect, but the city could have done a lot worse. I live in the area also. The fact is nothing we do is going to succeed all that well unless we get serious about drastically reducing motor traffic volumes. That’s what slows buses down. The volume of motor traffic here is horrendous. It’s easily doubled during peak hours since I moved here 36 years ago, and probably quadruped during off-peak hours. I can’t even enjoy riding my bike until at least 9 or 10 PM (midnights in summers) because of all the f-ing cars. It’s good to make bus service more attractive by making it faster but at the same time let’s actively discourage driving. Start by banning all curbside parking on arterials except deliveries. Add in residential parking permits on side streets so only someone who lives in a house can use the space in front of it. Eventually even phase that out with a complete ban on curbside parking, even on side streets. By making parking harder, close to impossible near arterials with stores, you’ll actively discourage motor vehicle use. While we’re at it, ban private cars altogether from congested areas like downtown Flushing and downtown Jamaica. Really, what I said here applies citiwide. Vision Zero hasn’t a prayer of succeeding unless we reduce motor traffic volumes by at least 75%, better yet 90+%. The only motor vehicles in the city should be delivery, sanitation, emergency, public transit, and construction/maintenance vehicles. Greenways are a good idea, also, particularly in this area. Make some through streets bike only. Give bikes priority over motor traffic at intersections. This could be done via stop signs on the minor streets which cross the greenway, or signals which detect bikes and stop motor traffic at the major cross streets (or use overpasses/underpasses instead). Regardless of how it’s done, the idea is you get on a greenway knowing you have a nonstop trip until you get off. Nobody in power is serious about drastically reducing motor vehicle volumes. But a bus lane, even if just part time, on at least some parts of main st. is a real possibility in 2016. Kissena/parsons or 164 could see that too around the same time, maybe a year after. Banning cars from downtown flushing or jamaica won’t happen anytime soon. But widening sidewalks, or closing parts of some streets to cars and putting in pedestrian plazas could. It’s not revolutionary, but it’s moving in the right direction. Reducing motor vehicle volumes on (some) side streets should be doable though. You might not end up with a good place to ride fast, but a low stress bike network should build a constituency for other bike improvements in the area. At this point though we need revolutionary changes if we are to see anything substantial in our lifetimes. It continually amazes me how a supermajority in NYC doesn’t drive regularly and yet all we get are elected officials who cater to drivers. That tells me the system is broke. Obviously anyone running who might do anything to make life difficult for drivers would never get past the smoke-filled rooms where they decide who gets to run. The issue with side streets here as you know is that most don’t really go anywhere. They typically run for a mile or less, are often broken by arterials or highways. We need a few through streets designed for bikes only. It doesn’t have to be major arterials like Union Turnpike, but maybe some of the avenues in between arterials. 75th Avenue comes to mind. It’s already not bad, even for fast riders, having only two traffic signals between 199th and 164th, plus a few stop signs. Get rid of the stop signs, make the traffic signals priority for bikes (or have bike underpasses at 188th, Utopia, 164th, Parsons, and 150th), eliminate curbside parking, and you’re practically done. With the connection to the Vanderbilt Motor Parkway at 199th you end with a ~4.5 mile nonstop bike route, potentially over 7 miles if the VMP is eventually extended east to city limits. There are other similar streets elsewhere which could be redone at minimal cost. If they have gaps, they might be filled in with roads which can be traversed only by bike. Thanks for the info. I eagerly await SBS improvements and future expansion. I wish there was much more though, we need complete streets upgrades all over the place too. I do want to add that here in the Bronx, bus stops under elevated rapid transit lines are FINALLY getting pedestrian islands. This should have been implemented a a century ago. Let’s see what 25mph brings this year. However, I wish we didn’t measure street safety with deaths alone, since they make up only 1% of the collisions. We should measure injuries, AND close calls! A statistical analysis based on 24 hour video surveillance at random street locations can be used to estimate how many close calls occur, and how that number changes from year to year. The de Blasio administration's Vision Zero policies are working. And the safer streets get, the harder the city will have to work to keep making progress.